Leather-soled shoes are beautiful, comfortable, and historically accurate, but do require extra care and maintenance to keep in good shape. While we here at Royal Vintage are continually improving the durability of our leather soles, the nature of this material is that it does wear quickly. We sole our shoes in leather according to our customer's demands for historical accuracy, but this beautiful and period correct material comes with a few caveats. We've provided this guide and accompanying products to help you understand the nature of leather soling, and preserve the soles of your new historical footwear as long as possible. While this guide will help prolong the life of the leather soles on your shoes, your shoes will eventually need to be re-soled. This may be sooner rather than later, depending on the conditions in which you wear your leather-soled shoes. We strongly recommend using any of the methods here prior to first wear, to keep your leather soles in good condition. Soles that are worn without consideration, even brand new, may wear out extremely quickly. Inclement weather and surface texture can chew through leather soles at an alarming rate. If you are attending an outdoor event and you know the weather is going to be damp, be advised that your leather-soled shoes can suffer. Regularly application of a sole conditioner such as Angelus Mink Oil or Neatsfoot Oil will improve water resistance. You may choose to wear different shoes or use any of the sole preservation techniques below. If you are caught out and your leather soles become saturated, change shoes as soon as possible, blotting away any excess water with a towel, and allow to air dry. Once dry, treat your soles with a leather conditioner, to keep them from cracking, peeling, and/or separating. Leather soles that have been glued may come away from the upper when wet. Once completely dry, use a shoe-specific glue to re-adhere the soles. Often the toes and heels of leather-soled shoes will wear more quickly than other areas, especially on styles with very pointed toes, and when the wearer drags their feet. To offset the wear in these areas, toe taps may be applied either with an adhesive or nails. Toe taps come in steel or nylon, and a variety of sizes suited for various toe and heel shapes. Replace as needed. Hobnails or shoe tacks protect the soles by studding the leather. This takes the brunt of the wear, and also holds the sole together. Hobnailing was a common method of sole preservation and adding traction on military shoes and boots in the 19th and 20th century. Hobnails or tacks can be applied all-over, or just in areas of increased wear, such as the toes and heels. The best way to prolong the life of leather soles is to have a half or full sole applied over the top. 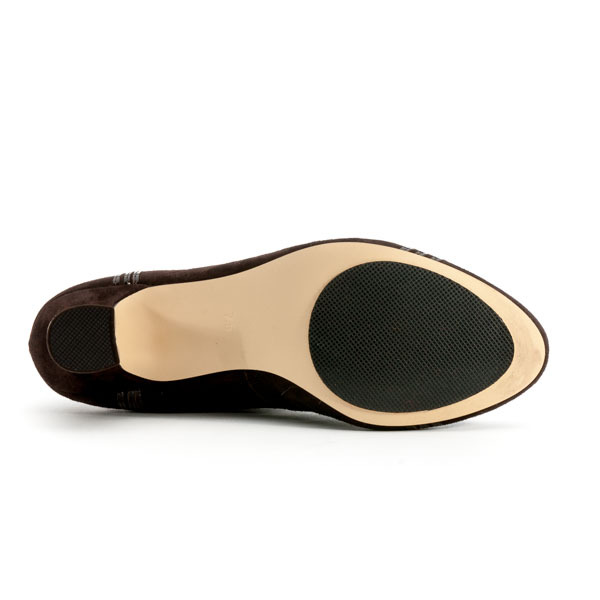 This is especially effective for interpreters needing a non-slip sole, but it does reduce the historical accuracy of your shoes. If you reenact in a wet or rough outdoor area, applied soling is your best bet for safety and durability on your historical footwear. Half and Full soles can be applied by any shoe repair shop. Offering both non-slip safety and some protection for your leather soles, rubber non-skid pads are easy to apply and can be cut to size to treat trouble areas such as the edges of heels and toes. The self-adhesive backing, low-profile, and low cost make these non-skid pads a good option for sole preservation. Replace as needed. Eventually, you will need to re-sole your leather shoes. Any shoe repair shop can re-sole your shoes, though costs vary shop to shop. Soles must be replaced before they are worn-through, so keep this in mind when considering methods of preserving and treating your soles for the longest life. If you see areas of intense wear on your soles, don't wait to combat the problem - discuss options with your shoe repair shop professional, or consider any of the methods above.